Jio Payments Bank is a JV (Joint Venture) between Reliance Industries Ltd and State Bank of India. Jio Payments Bank has now received RBI (Reserve bank of India) nod to start its operations. The operations are likely to kick start later this month according to a report by Livemint. Jio Payments bank to attract customers may offer Jio freebies under the promotional schemes. The bank aims to sell various financial and insurance products along with the regular banking services to boost the revenue. Jio has 100 million customer base which Payments bank will leverage to offer banking services. Besides this Jio retail network, merchant tie-ups, neighborhood Jio retailers and e-tailers will ease out Jio at the operational level. The details about interest on money deposited in Savings account is not yet known but will be set competitively among the other players. Along with Jio Payments Bank, the other players who received RBI nod to start a payments bank are PayTM, India Post and Bharti Airtel. Bharti Airtel has already operationalised its Payments Bank in January. Airtel Payments Bank offers 7.25% rate of interest on the savings account and 500 mins of Airtel to Aitel talk time to the new customers who opens an account with it. India Post Payments Bank (IPBB) will be starting its operations from September this year. IPBB will be leveraging the Aadhaar numbers by utilizing them as bank A/c number making the banking services so easy. 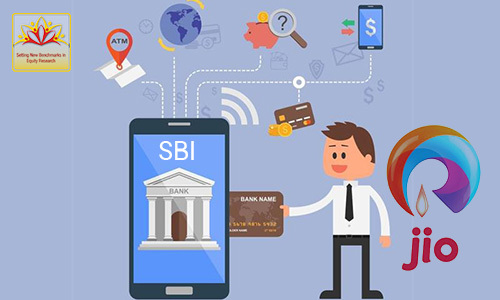 Jio Payments Bank will revolutionalize the way banking can be done by utilizing the high-end digital services of Jio. Mukesh Ambani's idea to diversify his businesses had laid the foundation stone to many such businesses. RIL holds 70% stake in Jio Payments Bank and SBI owns the rest.